People without FH tend to start getting high LDL cholesterol in middle age and take several decades to develop coronary artery disease. If you have FH this process starts at birth and means you can develop coronary artery disease as early as your 20s and 30s. When you have FH, heart attacks at such a young age are not uncommon. Sometimes these heart attacks are fatal. FH is one of the most common, inherited conditions. It is estimated 1 in 300 people have FH, that’s 77,000 people in Australia of which 80% (61,000) have not yet been diagnosed. In certain groups of people, such as Afrikaner, Christian Lebanese, Tunisian, French-Canadian or Ashkenazi Jew, the incidence of FH may be higher still. Why do people with FH have high LDL cholesterol? Normally LDL cholesterol is moved from the blood into the liver by LDL receptors, which can be thought of as ‘doors’ (Figure a). For people with the most common form of FH, half these LDL receptors (the ‘doors’) in the liver do not work properly. This means the LDL cholesterol cannot be moved efficiently from the blood into the liver causing the LDL cholesterol to build up and over time deposits in the artery walls causing atherosclerosis (Figure b). A gene is the unit of hereditary which carries information from parent to child. We are interested in the gene which carries the instructions on ’how to make an LDL receptor’. Everyone inherits one LDL receptor gene from their father and one from their mother. This means that 50% of the LDL receptors come from the father and 50% of the LDL receptors come from the mother. 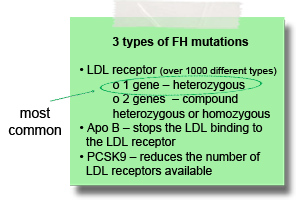 In FH the gene which makes the LDL receptor is ‘faulty’ (or is said to have a ‘mutation’). This means the LDL receptors are made incorrectly and can’t move LDL cholesterol from the blood into the liver. You inherited one ‘faulty’ LDL receptor gene from one of your parents, so 50% of your LDL receptors don’t work; you have heterozygous FH. I have heterozygous FH, will my child/children have FH? There is a 50% chance that any child will get the ‘faulty’ LDL receptor gene (F) i.e. 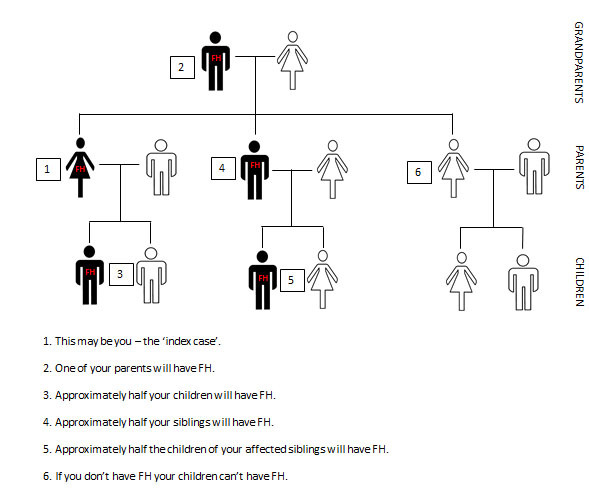 if you have 4 children, two are likely to have FH. 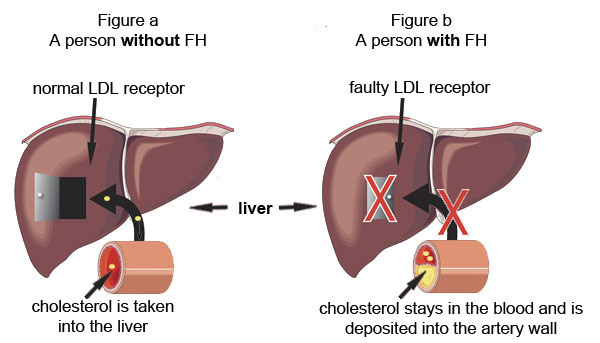 FH is an autosomal dominant disorder which means if you have the ‘faulty’ LDL receptor gene you have FH. If you inherit two ‘faulty’ LDL receptor genes from both of your parents (both parents have FH), then none of the LDL receptors work. the same type – called homozygous FH. These are very rare (1 in 300,000 to 1 in 1,000,000) and very serious forms of FH. *There are over a 1,000 different types of LDL receptor mutations. FH can often be traced over several generations.